Service providers should make some time once in a while to reflect on their current situation, and define a strategy or road-map to stay relevant in the longer term. Small improvements can make big differences, as they say, yet once a while bolder steps and moves into new territory may be necessary if you want to stay successful. 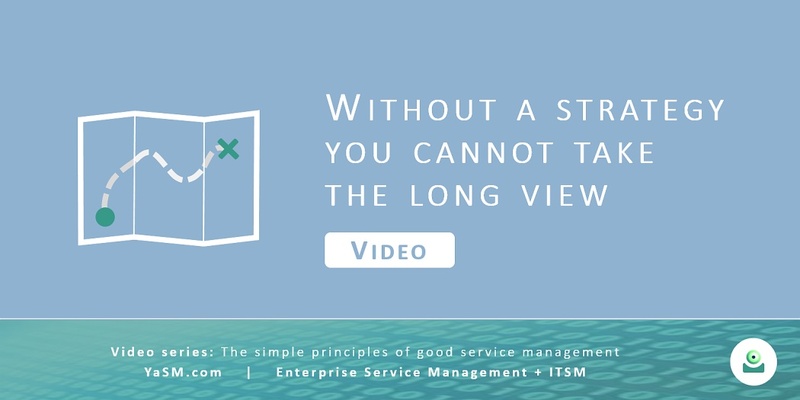 In this video you'll learn more about what strategic thinking means in the context of service management, and what kind of advice you can find in the YaSM framework. This video about service strategy is the fifth one in our series about "the simple principles of good service management - and how to apply them in practice": There have always been a number of time-tested, simple principles in service management that we must get right in order to become successful providers of services. In our videos we explain how you can bring these principles to bear in your organization. Part 5: Without a strategy you cannot take the long view. - Strategic assessments and the service strategy (on this page). To learn more about YaSM's strategic process and the YaSM service lifecycle please visit the free YaSM Wiki. Hello again, this is video number five about the simple principles of good service management, and today we discuss how strategic thinking helps service providers stay relevant in the longer term. Thinking strategically means that, once in a while, we make some time to reflect on our current situation and how the world is changing around us. Based on this assessment, we can define a strategy or road-map, for example for developing new capabilities and service offerings. So in this video I want to tell you more about what strategic thinking means in the context of service management, and what kind of advice you will find in the YaSM framework. Of course, in an earlier video we already talked about continual improvement, which is mainly concerned with enhancements to existing services on a smaller scale. Such small improvements can make big differences, as they say, yet once a while bolder steps and moves into new territory may be necessary if you want to stay successful. First comes an analysis of our current situation. Then we identify possible opportunities and explore their potential benefits and risks. And finally we need to decide what we will do and define an action plan. Maybe you remember that, in one of my earlier videos, I presented a medical laboratory offering a blood test service - in two varieties: A slower standard service, and a fast express service. Would it make sense to upgrade or enhance the service, for example by testing for additional parameters or by delivering the results even faster? Could the service be offered in new markets, such as new customer groups or other geographic regions? Or how about extending the range of services to include the examination of biopsied tissues or the analysis of urine samples? Of course we should also evaluate if our existing services are still economically viable, and if one of them is not we may well decide to remove it from our range of services. But a lot of things need to happen inside the organization before the customers can use these services, so it's important that we also assess our internal supporting services. A key supporting service is the one for examining samples, and during the assessment we could check, for instance, if new technology is available that can produce more accurate results or takes less time for analyzing a sample. Then there are a few more supporting services, such as the ones for collecting the samples and for billing. Finally, all services need information technology to work, which is provided by an IT service. For all of these services we should think about potential savings, for example by using external service providers. Typical candidates are commoditized services such as billing, where outsourcing may lead to cost savings. Strategic thinking - a complex undertaking? With these examples I wanted to explain what strategic thinking means in the context of service management. Sadly, the strategy part of the service lifecycle is not a priority for many organizations - probably because some service management guidelines make the topic look rather complex and academic. Here, for instance, I have the official ITIL® book on service strategy. On some 500 pages you will find descriptions of concepts and principles... It's all useful and good information, but it's also a bit daunting, and that's why the service strategy book often catches dust on the shelf. And that's why in YaSM we describe a straightforward strategic process that's not too hard to understand and implement in practice. We find the strategic process right at the top of the service lifecycle. And also ideas and suggestions that may come from almost anywhere in the organization. Based on this information, we perform a strategic assessment and document its results in a strategic assessment report. Once we have identified and prioritized our opportunities, we can create an action plan - which may, for instance, trigger the design of a new service. These processes and documents are described in detail in our YaSM® Process Map. and then define, start up and monitor a number of strategic initiatives. For each sub-process, YaSM contains a more detailed flow chart. Assessing our capabilities, weaknesses and strengths. we compile a set of strategic objectives. If we click on the link for the assessment report, for instance, this will open a text file in Word™ format. In YaSM, we call these files "checklists" and they describe the typical contents of the various documents we use in YaSM. As well as insights from evaluating our capabilities, weaknesses and strengths. As you may guess already, you can - of course - use this document as a template, so getting started with your first strategic assessment reports shouldn't be too much of a challenge. Now, let's close the checklist and switch back to Visio® again, because I'd like to show you that in the top area, where we have the process outputs, we can also see what's supposed to happen next. I hope you will agree that strategic thinking is something every service provider should do once in a while, and that it doesn't have to be a time-consuming and academic and exercise, because in YaSM we describe a straightforward strategic process and we give you the templates you need to get started. And if you have special needs, nothing speaks against exploring the many great books that have been written about business strategy and combining these ideas with the advice we provide in YaSM. Thanks for watching! And as always, if you have any questions we are happy to answer them in the YaSM community.